Cost: Student $20, Non-Members $100. Cost includes round-trip transportation, meals while not on the road, access fees, yoga instruction, yoga equipment and camping gear. Do you need a stress free weekend away from school? We've got the trip for you! You will be able to strike your best rendition of warrior pose while overlooking the second largest canyon in America. 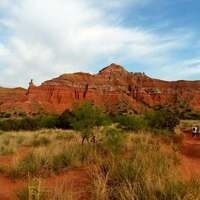 Our hike through the breathtaking West Texas scenery will be combined with a handful of relaxing yoga classes. We hope to lead you through an amazing weekend that will leave you rejuvenated and ready to fire up for finals. *There will be a mandatory pre-trip meeting the week of the trip, and we recommend participating in a Yoga class offered at the rec center prior to the excursion. We will contact you with more information at a later date.